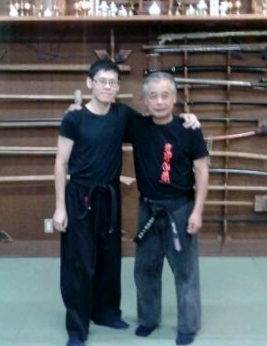 Noguchi-Sensei moved the way Hatsumi Soke used to move in the old videos that I watched when I started training. Subtle evasions, flamboyant showmanship and loads of resultant pain on those receiving the techniques. He was also the tester wielding the shinai during my fifth-dan (sakki) test while Hatsumi Soke watched. At the classes I attended, he would show his approach to taijutsu using the Gyokko-ryu shoden waza, Kukishin-ryu bojutsu and the Jin Ryaku no Maki. He is a master manipulator, able to confuse and keep people mentally off-balance. For example, he would move his hand one way, have me look at that hand, and hit me when I was distracted. When he did it again, I would tell myself, “Don’t look at that hand!” but I’d still look and get hit. And by the third time that happened my fighting spirit would be totally crushed, because I would still look. I KNEW I shouldn’t look, I KNEW I was gonna get hit if I looked, and I STILL would look anyway. And get hit! So if laughing at yourself getting hit a few times in a row is your idea of fun, Noguchi’s class is the place to be. This is one of those things non-martial artists will never understand!